Focus Features was involved very early on but dropped out in 2004. Continuity: How much popsicle Cheryl has eaten at dinner changes between scenes. It is very rare to see a movie that can charm the hell out of an audience without the use of special effects, worn-out clichés and bombastic action set pieces these days. It's even more ridiculous to hope that you will see such a film for FREE. 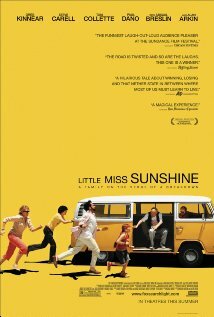 But that's exactly what happened to me tonight at a sneak preview of LITTLE MISS SUNSHINE. I "discovered" this movie right here at IMDb, having heard not a peep about it beforehand. By the time I finished watching the second trailer for the THIRD time, I was floored...and hooked. Luckily, the Bulletin Boards steered me toward the proper link to access sneak passes for tonight's showing, and all I can say is that it will not pain me one bit to pay for the privilege of seeing this gem a second time. 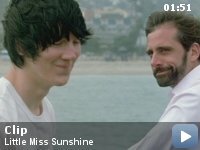 Assembling the best and most unlikeliest of ensemble casts you may probably see all year, SUNSHINE on the face of it is a relatively (pun intended) simple story. Little seven-year-old Olive (Abigail Breslin) has one wish in life: to be considered for the finals of the Little Miss Sunshine Pageant in Redondo Beach, CA. When her big chance comes at the most unexpected time, it's up to her unbelievably fractured family to pull themselves together and make it happen for her, no matter what it takes. And what it takes is a sad, painful, tragic and yet unendingly hilarious trek in a barely operational VW bus from Albequerque, NM to the Pageant. And although getting there is only half the fun and family drama, you have got to see what happens to believe it when they finally arrive and Olive gets to "do her thing." The strong cast sounds not a single false note, and when the more touching moments arrive, they don't seem forced the way they would in most other big-budget behemoths, because these moments are truly earned. But WHAT a collection of characters this is. Greg Kinnear is letter-perfect as Olive's judgmental, failed motivational-speaker father; Steve Carell finds new shades of darkest despair and human comedy as her suicidal gay uncle, a leading Proust scholar; Paul Dano does amazing things with little more than facial expressions as Olive's older brother who's deep into Nietzche and a vow of absolute silence, and Alan Arkin, though he has played this kind of role with both hands tied behind his back and his eyes closed, still shines like a crazy diamond as her cantankerous and hedonistic grandfather. 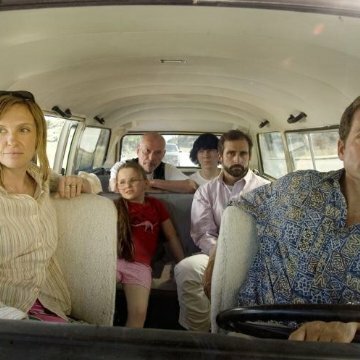 And barely holding this motley crew together is Toni Collette, who amazes by playing a mother again and yet manages not to portray the role exactly the same way, (you might recall her Oscar-nominated turn as Haley Joel Osment's put-upon mom in THE SIXTH SENSE.) I'm not at all familiar with the work of the two directors, Jonathan Dayton and Valerie Faris, or the writer, Michael Arndt, but they have definitely raised the indie film bar with this effort. Not a single moment is wasted; not a single scene is in this film without having a reason for being there, and it's all character-driven. There's also nothing fluffy about it - commentary about everything from how twisted our pop culture can be, to how our drive for being #1 winners can blind us to all of the things that are the most important are all there under the bittersweet laughs and tears for the audience to discover. I can't recommend this one highly enough. And I can't wait to see it again.